Participants on the runway during swimsuit modeling. Organizers abandoned generally accepted international beauty standards but forgot to check participants’ passports. The times of perestroika and glasnost touched not only political and economic life but also lead to the cultural transformation of the country. In the spring of 1988 the Soviet Union's first ever beauty contest had the entire country glued to their TV sets. The first qualifying round of the pageant. It all started in 1987 when Moskovsky Komsomolets newspaper ran a contest for its most beautiful female reader. It was a great success and editors dreamed of staging something similar, but on a much larger scale. They took the idea to the Moscow Komsomol (All-Union Leninist Young Communist League) and a contest called “Moscow Beauty” was born - funded by the League and sponsors, mostly Burda Moden. They decided to register all entrants without considering beauty standards. April 20, 1988. Contestants are waiting for their performance. The major problem the organizers had was that no one had a clue what a beauty contest looked like; their sources even included consulting library books. Castings were held in Gorky Park. Organizer Marina Parusnikova recalls that the queue started from the metro station, and there were not only young girls but also women with children and husbands. The process lasted for several months. In total, organizers accepted 2,500 profiles and choose 36 finalists. The final was held at the Sports Palace in Luzhniki. There were three stages: on a catwalk in swimwear, national costume and evening dress. Maria Kalinina (school girl, 17 years old) during the catwalk in swimwear. Usually, at such competitions participants wear identical swimming costumes, but in this contest they all brought their own allowing the audience to enjoy one-piece swimwear, as well as flamboyant bikinis of all colors. Participants answer the questions of satirist Mikhail Zadornov. As the finals arrived there were only six bright and beautiful girls left. That's when problems began to mount. Parusnikova remembers that after deciding to check their passports they found some were married - which was strictly against competition rules. Finalist Irina Suvorova not only had a husband, but also a child. She was not disqualified but had to forget about hopes of winning the crown. Among the six finalists was 20 year-old Oxana Fandera, today a famous actress. Although the jury liked her, she had no chance of winning the main prize as had recently arrived in the city from Odessa and was not formally registered in Moscow, which was another rule. However, Oxana did end up among the winners. One of the favorites - Elena Durnyova - was hampered by her surname, which in Russian means "not beautiful". So, the jury decided not to give her the title of first Moscow beauty queen. 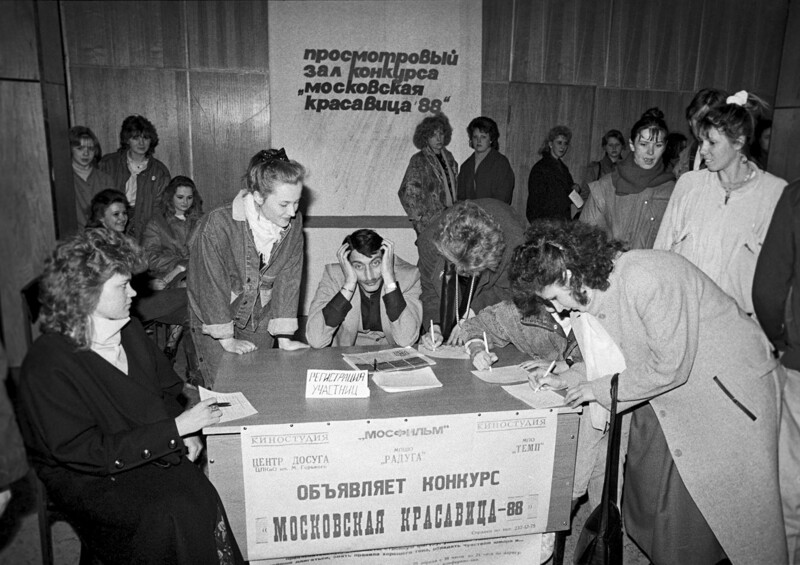 Participants of the first Moscow Beauty-88 contest. The first "officially" recognized Soviet beauty was Muscovite Maria Kalinina. Speaking to reporters later, she said contestants had to provide their own outfits, so their friends helped gather suitable clothing, and only in the final did sponsors dress them. Maria Kalinina, winner of the Moscow Beauty-88 pageant. Maria became a model for Burda Moden and later enrolled in a Hollywood acting school. Her expenses were covered by a couple of American pensioners she met at an event in the White House. Today Maria lives in Los Angeles and teaches yoga. Larisa Letichevskaya during the coronation ceremony on Red square. 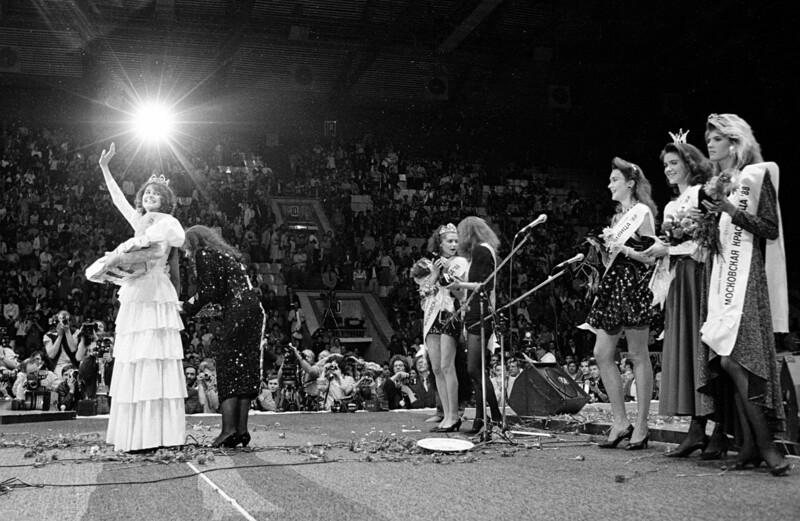 A second contest the following year was won by 20 year-old student and Komsomol member, Larisa Litichevskyaya. The third and final time the beauty pageant was staged was in 1991 and although the contest was more professional, it was lost amidst much more tumultuous events in the country that year. Soviet women’s search for style: Who helped determine their tastes?